Your Trusted Walk in Tub Experts! 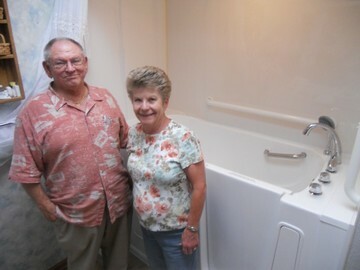 Serving homeowners throughout the United States since 2007, Independent Home Products, LLC has proudly provided residents with custom walk in tubs and walk in showers. Our mission is to keep our customers as safe and independent in their homes as long as possible. Independent Home Products, LLC manufactures 10 different sizes and models to choose from. We can design a custom walk in bathtub or walk in shower to fit any bathroom space. Independent Home Products, LLC has set the national standard for functionality, durability and beauty. Whether you are in need of a hydrotherapy tub to manage aching joints and muscles or require a walk in tub due to difficulty with bathroom mobility, Independent Home Products, LLC is the nation's choice for quality walk in showers and walk in tubs that are built to last. We have contributed to improving quality of life for thousands of folks, and we look forward to being of service to you. Why Choose Independent Home Products, LLC For Your Walk In Tub? All of the staff at Independent Home Products, LLC are trained in producing quality products with bathroom safety as the highest priority. Walk in tubs are big investments. They increase bathroom mobility and quality of life. The caring experts at Independent Home Products, LLC will work be available during every step of the process; choosing a walk in tub that best suits your budget and needs to installing the walk in tub in your home. All of the walk in tubs installed in by Independent Home Products, LLC installers are manufactured at our headquarters in Long Island, New York. Our walk in tubs and Freedom Walk in Showers are designed and manufactured using the newest technology available and then shipped to your home, where it will be installed in as little as one day! Because all of the walk in tubs are manufactured in our facility in New York, our lead time is quick. Our walk in tub experts can complete the steps of measuring your space, helping you choose he best walk-in to fit your needs, order the walk in shower or tub, build it, ship it and install it within 10 to 14 days! Our system is streamlined to flawlessly fulfill orders, and that savings of time and money is passed on to our customers. "As an educated consumer I have been accused of being obsessive about "doing my research". The fact that this purchase of a walk-in tub was for my mom made me be even more diligent. That's when I came across Independent Home online. From my initial call with Ari I felt at ease with his concern and desire to accommodate us with whatever we would need. He visited her home and I must say that this is where he belongs... In your home. As a nurse I am sensitive to the fact that those in the "home care" world must have empathy... He listened intently to the details of mom's latest fall. He picked up right away on my anxiety given the fact that I live out of town and am trying to do whatever I can to make her home as safe as possible. His calm, caring demeanor allowed me to be able to hear all the information he was sharing with me. After a few minutes with his tape measure he laid out a plan for us. I never felt pressured or uncomfortable with the decisions I needed to make regarding the tub model that we chose. On installation day my "crew", Riaz, Roberto and Brian, showed up at the door ready and prepared for the day. I was taken back by their care and respect for my mother's home... not the usual with my experience with contractors/installers. They listened to me, listened to Ari who had spoken with them before they came and did not stop working for the entire time they were here!! The ancillary concerns I had when I initially met with Ari were carried out by the crew to a T. Roberto went over everything with me during the demonstration of the tub operation and I was thrilled with the entire experience. If you don't choose Independent Home for your tub purchase and installation I wish you luck. 5 stars does not say enough. Thank you so much IH... Please consider this review a verbal hug!!!" Call Independent Home Products, LLC to discuss your Walk in tub needs!